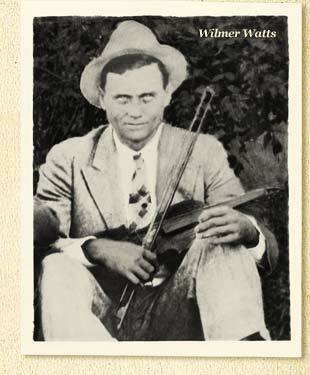 Another well-known musician employed in Gaston County cotton mills was singer and banjo player Wilmer Wesley Watts (1897-1943), who worked as a loom fixer at the Climax Spinning Company in Belmont and performed with several local stringbands during the mid-to-late 1920s. Born in 1897, Watts was originally from Mount Tabor (now Tabor City), a market town in Columbus County, in the southeastern corner of North Carolina. He developed a serious interest in music as a child, and, although he never learned to read music, he did play several stringed instruments, including the fiddle, banjo, guitar, steel guitar, and autoharp, as well as the harmonica, drum, and even the musical saw. He became so musically proficient, in fact, that he sometimes performed as a one-man band, playing five instruments at once. Around 1931, according to family members, Watts won first prize with his act in a contest at a Mount Holly theater. Uncle Dave Macon reportedly served as one of the contest judges. Watts was an avid fan of hillbilly music, and owned a cylinder talking machine and later a disc phonograph on which he enjoyed listening to the latest records of Gid Tanner and the Skillet Lickers, Jimmie Rodgers, Jimmie Davis, and his favorite, Roy Acuff. Around 1921, after settling in Belmont, Watts immersed himself in the local music scene, and by 1926, he and a steel guitarist and singer named Frank Wilson, with whom he worked at the Climax Mill, were teaming up to entertain their fellow millhands at Gaston County social gatherings. Research by Bob Carlin reveals that Wilson was born in Chinquapin, in Rockingham County, North Carolina, and that his full name was Percy Alphonso “Frank” Wilson (1900-?). Like Wilmer Watts, Wilson was a talented multi-instrumentalist.